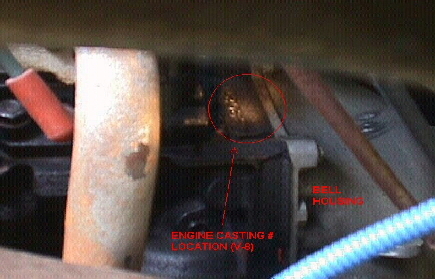 The casting number is located on the driver's side, top rear of the engine block. The number on the front passenger side of the engine block will NOT tell you the displacement of the engine block. I used a lumber crayon to highlight my casting number. I still got it wrong the first time. I also have a 3 inch body lift which makes seeing the number easier. Your view of the number will vary, but this is where it is located. Chances are it is buried under grease and grime. 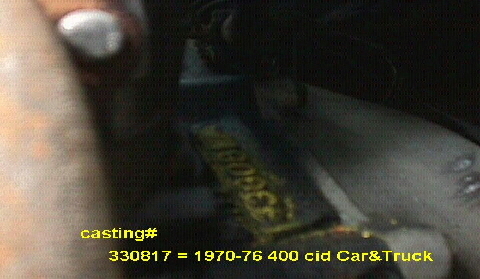 Once cleaned, if you cannot see it, you can use "silly putty" or something similar to make an impression of it, then use a mirror to read the number. This is by no means a complete list. These are some of the more common numbers. E mail me your V8 casting number if it is not in this list and I will see if I can find it for you. Contrary to popular belief, all trucks did not come with 4 bolt main bearings from 1973 - 1987.